Merry Christmas from our family to yours! 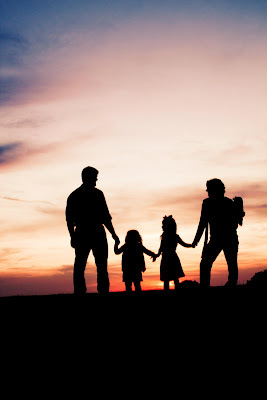 May it be filled with wonder and awe that God loved us so much that He sent His Son, Jesus, to this earth as an atoning sacrifice for our sins (1 John 4:10). "The prayer of my heart this Christmas is that people would understand that Jesus is the person they were made by and made for—that they would understand that He loved them enough to go to the cross for them and pay the price for their sins so that they could live forever with Him on the New Earth, the eternal Heaven. 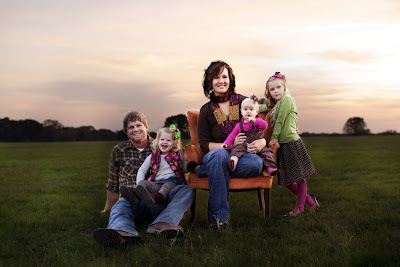 There's a true story of a Christ-loving man who lay dying. His son asked, "Dad, how do you feel?" His father replied: "Son, I feel like a little boy on Christmas Eve." Christmas is coming. We live our lives between the first Christmas and the second . We look back to that first Christmas and the life of Jesus on the earth for some 33 years—but we look forward to the Christmas in which the resurrected Christ will return and we, his resurrected people, will live with him forever on the New Earth. And right when we think "It doesn't get any better than this"....it will!" 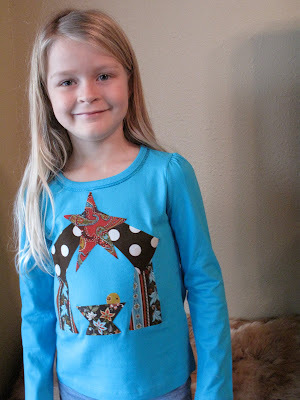 I made a last minute craft last night for the girls to wear for Christmas......Nativity Shirts! When I saw this template in Sophia Grace's Etsy store I had to make them. You should go check out some of the other templates in her store. 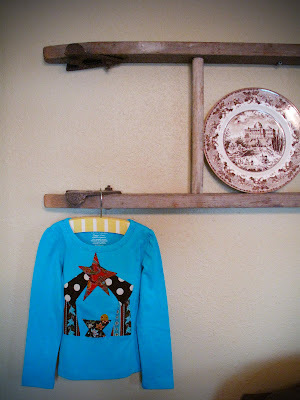 A little boy in my life will be sporting the owl and neck tie shirt too! They were extremely simple. I used Heat N Bond and the template from Sophia Grace. 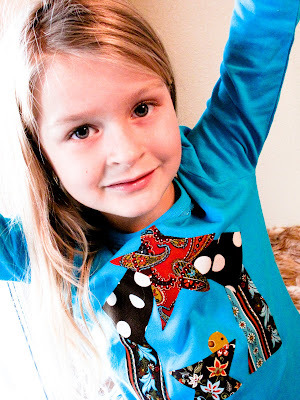 It's not too late to make your little one a nativity shirt. 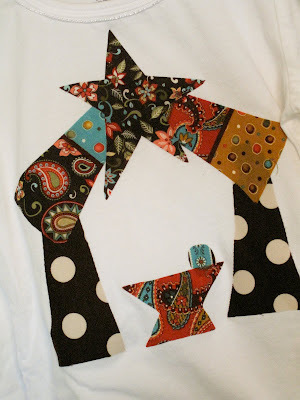 If you have scrap fabric, heat n' bond (walmart), and a plain shirt....you can do this. They are extremely simple. I made 4 in under an hour. 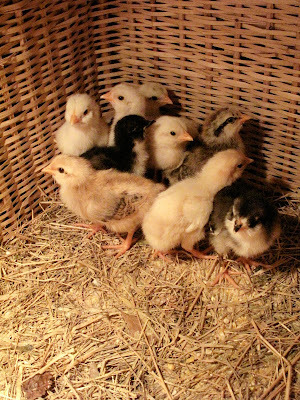 As life on a farm would have it, I had to rescue some baby chicks from dying in the winter chill a few days ago. Their momma hen literally "counted her chicks before they hatched" and got off her nest while her eggs were still hatching......hmmmm, that phrase totally makes sense now. I found some abandoned chicks that were newly hatched and wet out in the yard roaming around chirping for their momma. I knew that within a matter of hours they'd be dead. 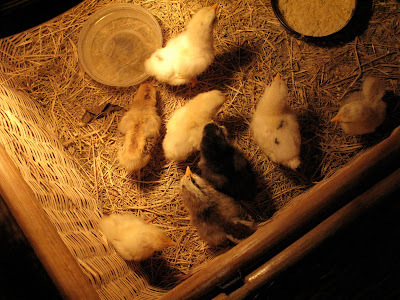 I put them in a basket with a heat lamp on them. And there they reside, below the nativity scene in my home. I kind of love this imperfect look. It just about sums up my life. Farmer Jason was a bit in shock that I, the festive Christmas nazi, put these little boogers in the midst of all of Christmas decor. But, for me, it's just a good reminder not to get too uptight about things and focus on the overwhelming JOY of the birth of my Savior. Without the birth of Jesus, there would be no CROSS. 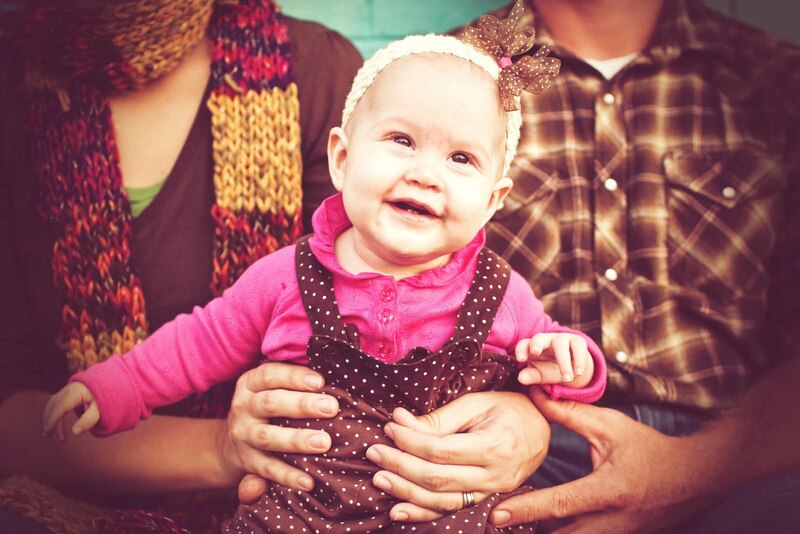 I'm overcome with thanksgiving and shear awe at what the Lord is doing in our home and in our hearts. He is so amazing. Jason and I have been reading this book and needless to say, it's one of those that can change your life if you let it. The book is infused with scripture on every single page and is filled with TRUTH.....some really hard to swallow truth. And yet it is simple.......Jesus demands our all. Not our leftovers, not a little, not half, not the majority....our ALL. "Does something deep inside your heart long to break free from the status quo? Are you hungry for an authentic faith that addresses the problems of our world with tangible, even radical, solutions? God is calling you to a passionate love relationship with Himself. Because the answer to religious complacency isn't working harder at a list of do's and don'ts — it's falling in love with God. And once you encounter His love, as Francis describes it, you will never be the same. Because when you're wildly in love with someone, it changes everything." So good to be reminded of that this Christmas. 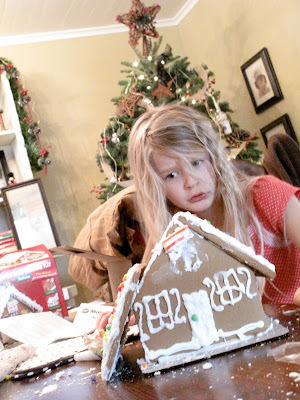 I wish I could report to you that our Gingerbread house decorating experience was a success. But, that simply is not the case. A "disaster" is a more fitting way to describe it. That tiny little house caused my whole dining room to explode. I have witnesses...Holly??? Robyn??? One thing I am glad about is that I didn't decide to be all stupid-crazy and home make my own gingerbread, icing, and do raisins for trim instead of purchasing this pre-fab kit in a box. I'm pretty sure that the end result would still be the same. Maybe my kids wouldn't be high from sugar. That was not a smart move to take this on right before nap time. And I tried telling them NOT to eat the do-dads, but that wasn't fair. Seriously. They are walking around like crazy people all wide-eyed and twitching. I'm not quite for sure exactly how ours went so wrong so quickly. I definitely do NOT like tedious detail-oriented crafts. That could have been in it. Nor is a detail-oriented craft a grand idea for 3 kids under the age of 5. What was I thinking??? One thing is for certain. 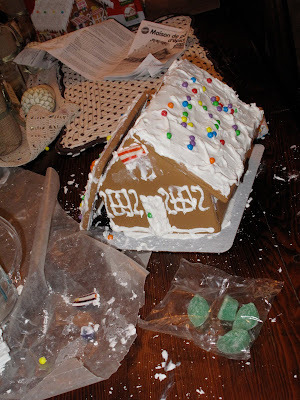 I'm pretty sure we will never again make a Gingerbread House. I had good intentions of starting a tradition of making a Gingerbread House and taking a photo of them every year. How grand would it be to look back upon our beautiful pieces of art we've created over the years? Mark my words. And I'm totally more than okay with never making one of these things again. One of my main terms of endearment for Ruthie is 'Pea Shooter'- for no reason in particular. I've not ever heard this before, nor is it something you typically hear when a parent refers to their child. But, for us, it works. And I love it. You can imagine my delight when my friend, Holly, showed up at my house with this adorable knitted pea hat. There is a little knitted pea pod on the tip top of the hat that is just precious! 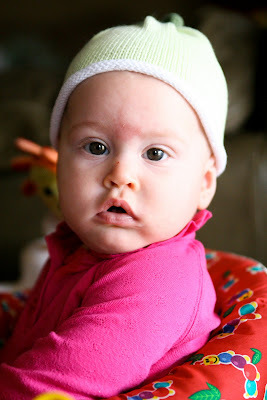 I thought I'd snap a few photos of my 'Pea Shooter' in her hat. 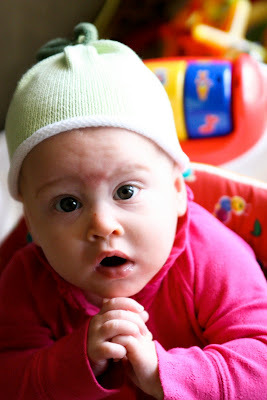 The praying 'Pea Shooter'.....doesn't it look like she is praying?? Kaylyn could not stop telling Ruthie how cute she was and of course had to have pic of her with her baby sister! Ruthie gets lots of kisses! 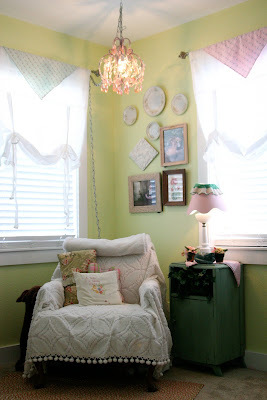 When we had Ruthie and added on to our house, we re-decorated Kaylyn's room and gave her all new furniture (our old bedroom furniture). 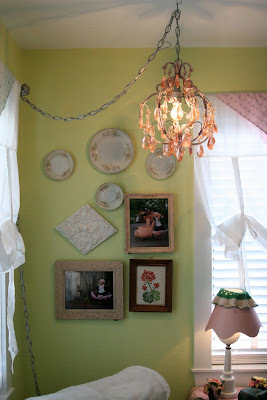 Her previous room was in vintage schoolroom-themed decor- scroll down to the bottom. Our house has changed a lot since that post since we added on (more pics to come). 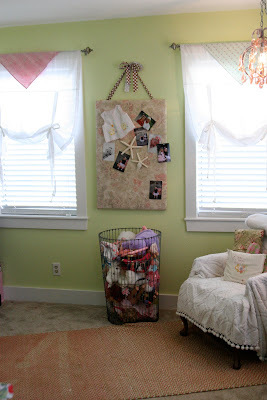 We recycled Kaylyn's old room and gave it to Laney Rae. It seemed to fit Laney Rae's personality a little better and was more "fun" and "playful". 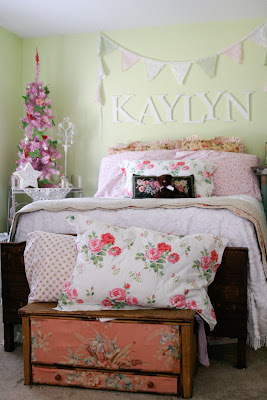 When I began brainstorming on Kaylyn's new room, I knew that I wanted it to be girlie. Kaylyn's main two requests were that it be PINK and have a PINK CHANDELIER. 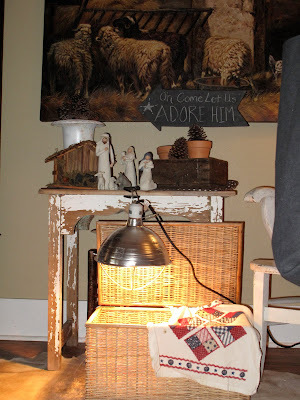 I wanted the look to be somewhat of a vintage shabby almost flea market look, but I didn't quite to know how to pull it off or pull it together. I didn't want all the pinks to match nor the greens. I also wanted her room to grow old with her. I wanted it to be appropriate for a 5 year old and an 18 year old. 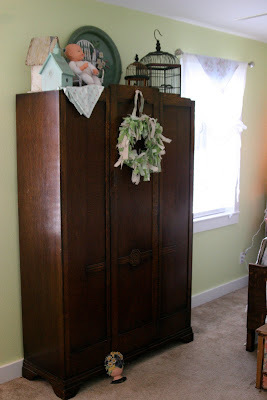 I also wanted it to serve as a guest room when we had visitors. So, it had to be inviting and cozy for adults too. I really didn't think it was possible to make all of this happen while achieving the "look" I wanted. She is a dear dear friend of mine and so talented. Holly has a heart of gold and has a passion for helping mamas just like me take their vision and make it happen leaving behind a beautifully functional home.....and not breaking the bank in the process. Holly is so good about taking your style and making it come to life. We had a blast together on this project. 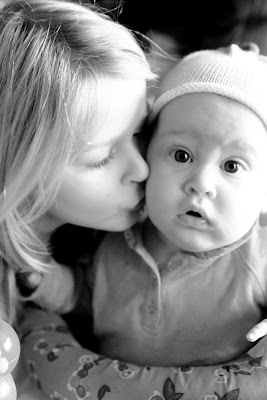 She made it effortless and fun- I was pregnant and hormonal at the time so I greatly appreciated that! Budget was also a concern of mine because I was re-doing three rooms at once. 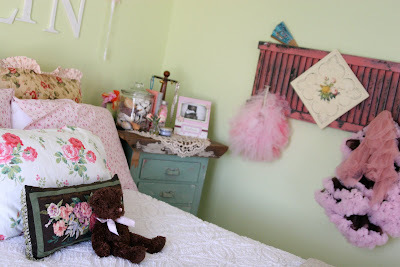 We re-purposed our old bedroom furniture and used it in Kaylyn's room. Most of the accessories were purchased either at thrift stores, resale shops, antique stores, or were given to me by Holly (she was re-doing a room at the time too so I hit the jackpot:) or Missy, another friend of mine. The curtains, shabby flag banner above the bed, and rug were all purchased from Target. Those were the only new items in the entire room. I even found the chenille comforter and chenille slipcover at a thrift store for dirt cheap. They were white and in perfect condition. Holly helped me with Ruthie's room and also our bedroom (pics to come) too. I'm so thrilled with how everything turned out. I could move in to Kaylyn's room myself....I love being in there and curling up with Kaylyn and reading a book. Its exactly what I wanted her room to be! Head over to Holly's site and check her out. Holly would be thrilled to help you out with your next decorating project. 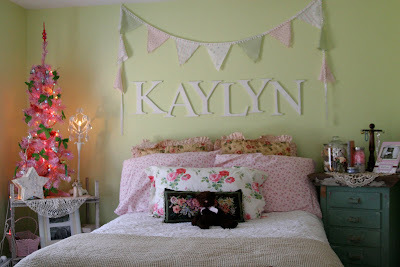 Below are some more pics of Kaylyn's new big girl room. 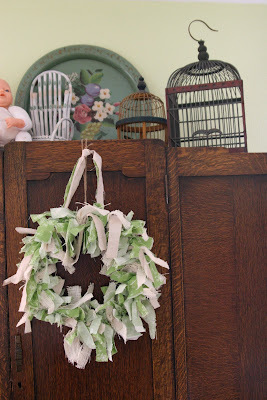 I made this wreath out of burlap, linen, and fabric using THIS tutorial. this basket is lovingly referred to as "the baby doll basket"
This left me speechless. Please take 3 minutes to watch this. It's titled appropriately,"The Awe Factor of God." Its from Francis Chan's website CrazyLoveBook.com. I've been wanting to read through "Crazy Love" for some time now. Ruthie's 1/2 birthday came and went over the Thanksgiving holiday. It's hard to believe she has been in our arms for 6 months because it feel like she has been here forever. She is nothing but sweet- such a cuddly happy girl. I could count on one hand the number of times she cries in a day. Even a cold and horrible cough wouldn't bring her spirits down. I'm really treasuring every moment I have with her during this first year of life.....those pre-mobile days. I often find myself just sitting with her in my rocking chair and cuddling. I've sang all of my girls this lullaby- heard in Dumbo, Beaches, and also sang by Allison Krauss (love this version the best). My heart leaps hearing my older girls sing it to Ruthie, which is quite often around here. Not because she is crying, but just out of the blue. they'd end up loving you two.